President Trump speaks about the passage of tax legislation on the South Lawn of the White House on Wednesday. Congressional Republicans delivered on their first major legislative accomplishment of the Trump era on Wednesday, when the House voted 224-201 to pass a $1.5 trillion tax package. The bill cuts individual rates for eight years and slashes the top corporate tax rate to 21 percent permanently. Trump signed the bill into law on Friday, hailing the legislation as "a bill for the middle class and a bill for jobs," adding that he was "very honored by it." In an event on the White House lawn Wednesday afternoon, the president, Vice President Pence and lawmakers celebrated and thanked each other for their work on the bill's passage. "I promised the American people a big, beautiful tax cut for Christmas. With final passage of this legislation, that is exactly what they are getting," Trump said in a written statement earlier in the day. "I would like to thank the members of Congress who supported this historic bill, which represents an extraordinary victory for American families, workers, and businesses." Republican lawmakers hoped to put the bill over the goal line a day earlier, after the House claimed victory in a 227-203 vote Tuesday afternoon, but hit a procedural hurdle. The Senate passed the bill with some slight tweaks in the early hours of Wednesday morning on a party-line vote, 51-48. "This is a historic night," Senate Finance Committee Chairman Orrin Hatch, R-Utah, said after the vote. The bill has been in the works for months. 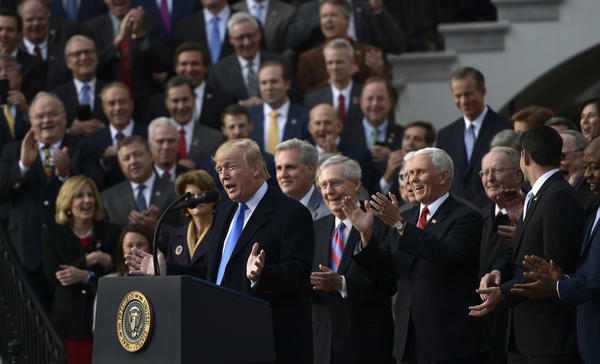 Republican leaders put a marker down at the beginning of the year to pass a tax bill by the end of the summer, though that had depended on passing a repeal and replacement of the Affordable Care Act in the spring, an effort that dragged out but ultimately did not materialize. The tax bill accomplishes part of that goal by eliminating the penalty for individuals who don't get health insurance. Republicans say that public opinion of the bill, which has been very low, will turn around as people start to feel the effect of tax cuts. "When people see their withholding improving, when they see the jobs occurring, when they see bigger paychecks, a fairer tax system, a simpler tax code, that's what's going to produce the results," House Speaker Paul Ryan said Tuesday. "Results are going to make this popular." People across income levels will see a tax cut of some sort under the bill, though most of the benefits will go to top earners. By February, federal income tax withholding is expected to be adjusted in paychecks, but for most people, the changes may not be apparent until April 2019 when 2018 taxes will be due for annual filers. The GOP has long sought a big overhaul of the tax code to simplify it by eliminating complex tax breaks and lowering rates, but in the end, the tax bill did not do much to actually simplify the code. Individual tax rates are cut for eight years, though a future Congress could choose to extend them instead of allowing an effective tax increase to take place at the end of 2025. "We have no intention of allowing that to happen," Ryan, R-Wis., said to CBS This Morning on Wednesday. The projection that the bill would add $1.5 trillion to the deficit over 10 years grows to $2 trillion if those individual tax cuts are made permanent, according to the nonpartisan Tax Policy Center. House Minority Leader Nancy Pelosi, D-Calif., referred in a floor speech to "the ludicrous Republican insistence — their claim — that these giveaways to the wealthiest will pay for themselves." GOP leaders have insisted that reducing taxes on the corporate side of the ledger will result in higher wages and more money being brought back to the U.S. from overseas business operations, but many economists doubt that the bill will spur significant economic growth or avoid adding to the national debt. Republican leaders have spoken of reducing entitlement spending as a priority for next year. "We need to keep focused on the spending side of the ledger, as well, " Ryan told ABC's Good Morning America, when he mentioned revisiting health care spending and welfare reform, which President Trump has also focused on. Democrats have been unable to break GOP unity to stop the tax bill as they were able to over health care, though they have said they look forward to how it will play in the 2018 midterm elections as they argue it's a boon for the wealthy. Senate Minority Leader Chuck Schumer predicted that Republicans will "rue the day" they voted for the tax bill. That day was delayed because of Senate rules, which prevent the bill from including any measures considered "extraneous" to budget matters. After the House passed what was believed to be the final version of the bill on Tuesday, Democratic senators challenged provisions relating to education and a technical issue over the naming of the bill. The Senate parliamentarian ruled that they did not fit inside the budget rules that the bill is being passed under, which allow it to be approved by a simple 51-vote majority, bypassing any risk of a Democratic filibuster.